Mix the mayo, mustard, salt and pepper in a dish and set aside. Preheat your oven to 475 degrees. Cook the asparagus (wash and rinse it first) on a paper plate or paper towel in the microwave for 1 to 3 minutes (depending on the microwave) until bright green and just tender. Set it aside. Take the chicken breast and pat it dry. Then beat the hell out of it with a mallet or a good rolling pin, until its flat, about ¼ inch thick. Then you add a slice of provolone cheese and three or four or six asparagus (depending on how many you want, how big they are, etc. ), and roll up the chicken nicely and place in a baking pan seam down (spray the pan with cooking spray first). When you’ve rolled all of your chicken and cheese and asparagus and placed it seam down in the pan, spread on the mayo/mustard mix evenly with a pastry brush or a plastic spatula coating all of the exposed chicken. Sprinkle with the breadcrumbs and press the crumbs in to make a coating of sorts. 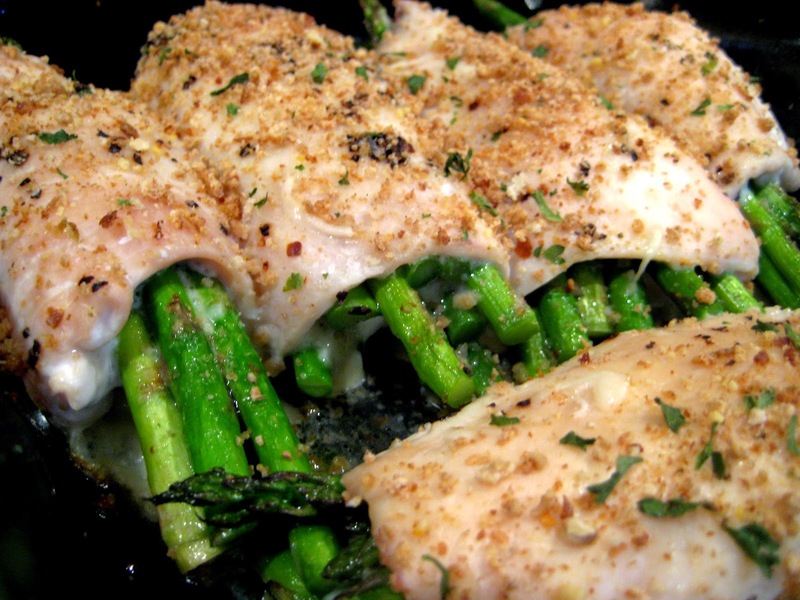 Bake at 425 degrees for 25 to 35 minutes, depending on the thickness of your chicken. Chicken is done with the juices run clear and the breadcrumbs are browned. The original recipe also called for 1 lemon zested and juiced to be added to the mayo/mustard sauce but we found that to be a very intense flavor that we weren’t really fans of once I made the chicken without the lemon the next time I made it. Feel free to experiment and make this recipe better for your family. My kids are picky. They’re teenagers now, I’m lucky to find something they’ll eat more than once that isn’t made of Doritos or cookie dough. All in all, we like these chicken wraps and I’m making them next time with broccoli to see how that turns out. I served them with buttered spaghetti the first time and smashed red potatoes (I used crushed red peppers and Parmesan cheese instead of rosemary) the second time.